Kreng - Lowlife (Original Motion Picture Soundtrack). Vinyl LP. Bleep. 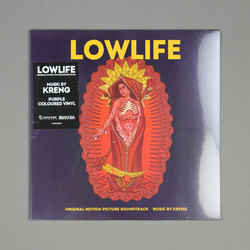 The latest soundtrack release from Invada Records - they have, among many others, the scores for Stranger Things 2 (Kyle Dixon & Michael Stein) and You Were Never Really Here (Jonny Greenwood) on their roster - is Kreng’s music for the crime-comedy Lowlife. While the flick is reportedly a fun bit of post-Tarentinoism, Kreng’s composition takes a more traditionally orchestral tack than Tarentino would. The paranoid strings of Bernard Herrmann (Psycho, Vertigo) bear a clear influence on the orchestration here. That said, there is something of a Spaghetti Western feel to things that old Quentin would approve of. There is also a sprinkling of heavy sounds - largely from the worlds of metal, industrial and drone - that adds a nice feeling of bombast.